The voices of Albert Brooks, Ellen Degeneres and others wrested back the top spot from a bunch of streetcar racers. 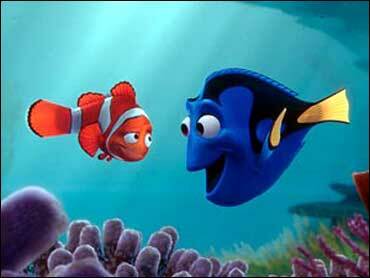 "Finding Nemo" earned $29.2 million to finish in first at the box office this weekend. "2 Fast 2 Furious" came in second with $19.1 million dollars and "Bruce Almighty" is still going strong in its fourth week with $14.2 million, reports The Early Show entertainment contributor Jess Cagle. The story about an ocean fish trying to rescue his son has grossed $192.3 million in 17 days of release. "It's poetic justice that a movie about a father and a son would be the No. 1 movie of Father's Day weekend," said Chuck Viane, Disney head of distribution. Although it opened at No. 1 the previous weekend, "2 Fast 2 Furious" fell to second place. Ticket sales tumbled 62 percent. New movies had middling debuts. "Rugrats Go Wild," which blends the Nickelodeon "Rugrats" and "Wild Thornberrys" cartoon franchises, was No. 4 with $12.5 million in ticket sales, followed by the Harrison Ford-Josh Hartnett comedy "Hollywood Homicide" with $11.7 million. The idiot-buddy prequel "Dumb and Dumberer: When Harry Met Lloyd" was No. 6 with $11.1 million. Lacking a strong new movie, the overall box office took a dip after rising for two straight weekends. The top 12 movies grossed $118.6 million. That was off 24 percent from the same weekend last year, when "Scooby-Doo" opened with $54.2 million. Theater business is expected to heat up again this weekend with the arrival of "Hulk." "Charlie's Angels: Full Throttle" arrives a week later, followed by "Terminator 3: Rise of the Machines" and "Legally Blonde 2: Red, White & Blonde" over Fourth of July weekend. "It's been a summer of fits and starts, a couple of weekends up, then down the next," said Paul Dergarabedian, president of box-office tracker Exhibitor Relations. "There's no question that over the next few weeks, starting with `Hulk,' we're going to see a resurgence." "2 Fast 2 Furious," $19.1 million. "Dumb and Dumberer: When Harry Met Lloyd," $11.1 million. "The Italian Job," $9.5 million. "The Matrix Reloaded," $5.5 million. "Daddy Day Care," $2.1 million. "X2: X-Men United," $1.6 million.